Sliding gates can offer an impressive array of benefits. They often come with panels that fold or roll up together to lessen the space that the gate requires to function. Relative to the amount of open space that a swing gate usually needs, this can be a huge plus. The panels can also mean lower repair costs, as each panel can be replaced individually. These are huge selling points that make sliding gates perfect for those with little space to spare who might also be looking for practicality above everything else. There are certain issues to look out for with sliding designs that can develop into more serious problems if left untended. It is very common for sliding gates to feature a track that runs along the ground. These types of tracks can develop problems quite quickly as they are exposed to a wide variety of possible threats. Wether it's the continuous vehicle crossing or simply the constant exposure to surrounding elements. Small dents in the track can cause the gate to stall, rattle or catch. It's also possible for the track to fill with dirt over time. If not cleaned regularly, the accumulated dirt can even force the gate out of position in some cases. For weight and affordability reasons, many sliding door designs will feature panels that are quite thin. This means the motors used to propel them can be less powerful and less energy demanding. It also means they can sustain damage more easily. Slightly bent panels are not a big issue, and can be efficiently replaced by an expert. If they are left in a compromised state however, they may impede the functionality of the system and their condition can worsen over time. 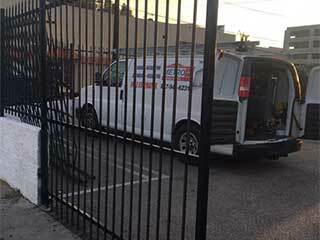 We at Garage Door Repair Woodinville ensure that your sliding gate keeps working smoothly for as long as it possibly can. We provide professional gate repair for a wide range of designs. From the damaged front yard entrance to a malfunctioning driveway gate. Call now!